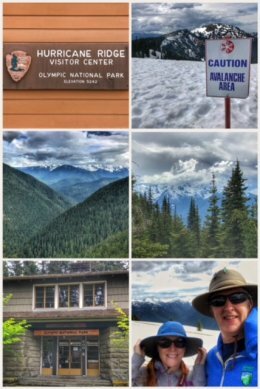 Continuing westward, we traveled to the Olympic Peninsula to seek out and explore the amazing variety of Olympic National Park, #12 on our list of national parks we have visited on this adventure. 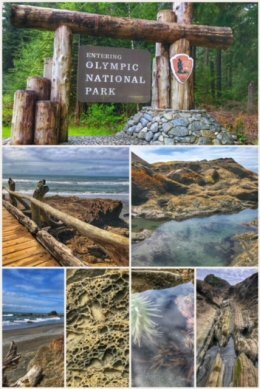 Of all the national parks, this one may offer visitors the most variety, including high, glacier-capped mountains, old growth forests, gorgeous coastline, and temperate rainforest within its 922,650 acres. The area was first designated the Olympus National Monument in 1909, becoming a national park in 1938. We suggest starting your journey with a visit to the newly remodeled visitor center in Port Angeles. There, rangers can give you the best ideas for traveling and hikes and best places to stop — depending on the length of your stay. Our first stop was to admire Mt. Olympus (7,980 feet in elevation) from Hurricane Ridge. Even with its modest elevation, because of heavy snowfalls, Mt. Olympus supports numerous glaciers (including Hoh, Humes, Jeffers, and Blue). While this area was still covered in snow (as the pictures above show), in summer months visitors can find a good number of hiking trails, from ridgetop traverses to steep trails that descend to subalpine lakes and valleys. 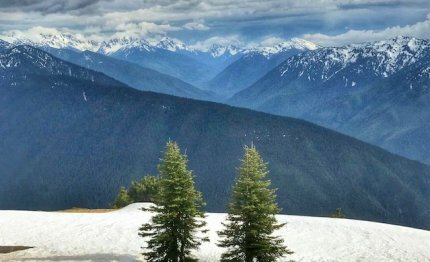 Geologists are still debating how the Olympic Mountains formed, but most say they are a gift from the (ancient) sea, rising up some 10 to 20 million years ago. 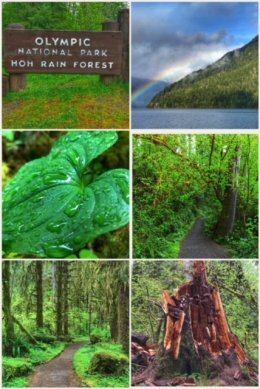 Having never been to a rainforest, a long drive to the west side of the peninsula was in order to spend time hiking through the Hoh Rainforest. The Hoh is the last remaining remnant of the Pacific Northwest rainforest, which once spanned the Pacific coast from southeastern Alaska to the central coast of California. The Hoh receives an average of 140 to 170 inches of precipitation annually; happily for us, on the day we visited, only a few sprinkles. You have the option of several trails to hike in the Hoh. Two easier trails are the Hall of Mosses Trail (less than one mile) and the Spruce Nature Trail (about 1.2 miles), both of which are great for hiking with small children or folks who do not want a long hiking experience. We chose the Hoh River Trail (which runs for 18 miles deep within the rainforest) because our ranger told us this was the best trail to truly experience the “Jurassic Park” feel of the rainforest — and while we only hiked about 2.5 miles into the rainforest, it was truly a magical experience — so green, mossy, and lush! Our wonderful ranger also suggested we check out at least one of the Park’s Beaches. (Some of the many beaches include Ozette Triangle, Rialto Beach, Second Beach, Ruby Beach, Kalaloch Beach, South Beach.) With his guidance, we went to Beach 4 because at low tide you get to experience the beautiful sea life in numerous tidepools. (Tidepools occur when the tide retreats, trapping seawater in depressions in the rocks. These shallow pools and surrounding areas uncovered by the retreating tides are often teeming animals and plants, which must adapt to environmental extremes to survive.) We enjoyed seeing barnacles, hermit crabs, and lots and lots of Giant Green Anemone (though some were also pink). The visitor center keeps a record of low tides to help you have the best experience. 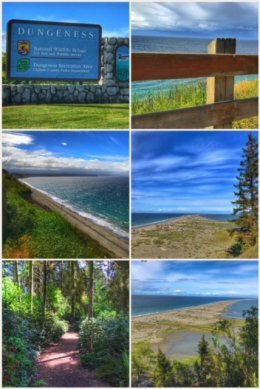 Last up was a fun hike in the Dungeness National Wildlife Refuge, located in Sequim. It protects the Dungeness Spit, one of the world’s longest sand spits — and the longest in the U.S. at 6.8 miles; the spit, which extends out into the Strait of Juan de Fuca, shelters a bay rich in marine life. Eelgrass beds attract brant, shorebirds feed on the tideflats, and ducks find sanctuary in the calm waters. Hiking, wildlife viewing, and photography are popular activities on the Refuge — and we partook in all three. While you can hike all the way down to the lighthouse, the day was a bit too blustry for us, so instead, we stuck to the fun upland forest trail that leads down to the spit and includes informative interpretive signs. Next up: Bellingham, Mount Baker, and Deception Pass!